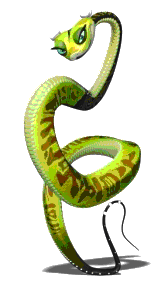 The snake form is important for developing qi within the five animal form. Because the snake is a calm animal, it has more relaxed energy. When the practitioner cultivates this energy, the combination of relaxation is mixed with quick, piercing strikes. There are no closed fists within the snake form. Instead, the hands are open and used for penetrating chops and finger strikes. The snake's spirit is calm and deliberate and once the practitioner develops the proper energy, his strikes are focused and lightning-fast.